Do you come back from weekend trips to find your plants & garden dying for water? Don’t feel like relying on mother nature or your unreliable neighbor to water your plants while you’re gone? Keep reading to learn how to water plants while on vacation so your succulents stay succulent and your vegetables are prize-worthy. When the weather isn’t cooperating and you’re not home to water your garden, you’ll need to take watering into your own hands with these outdoor methods. When you’ve got rows of garden or plants spread throughout your yard, you need an efficient way to keep them hydrated over time. A drip irrigation system attached to a single outdoor faucet will allow you to water garden rows or multiple flowerbeds at once. The perforated hose allows water to seep out as needed while you’re gone. 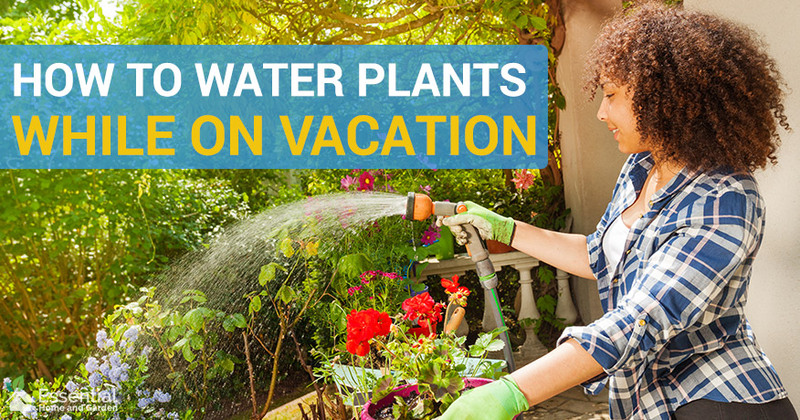 As long as the water’s on, your plants will stay hydrated regardless of if your trip is a weekend or a whole week. When you’ve got a whole yard to keep hydrated while away, smaller-scale options won’t do. With an above-ground water sprinkler setup, you can water your whole yard at once without having to dig up your whole yard. 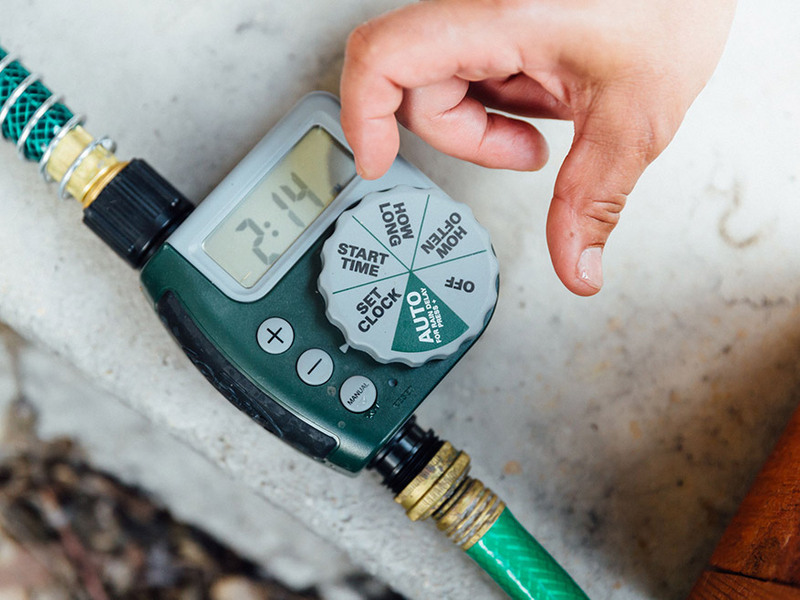 After attaching the timer to your faucet, you can connect the rest of the hose to the sprinkler head(s) you’ve setup across your yard. On the schedule you set, the sprinklers will have access to the water from the faucet and spray everything within their range. Learn more about this method on cnet. 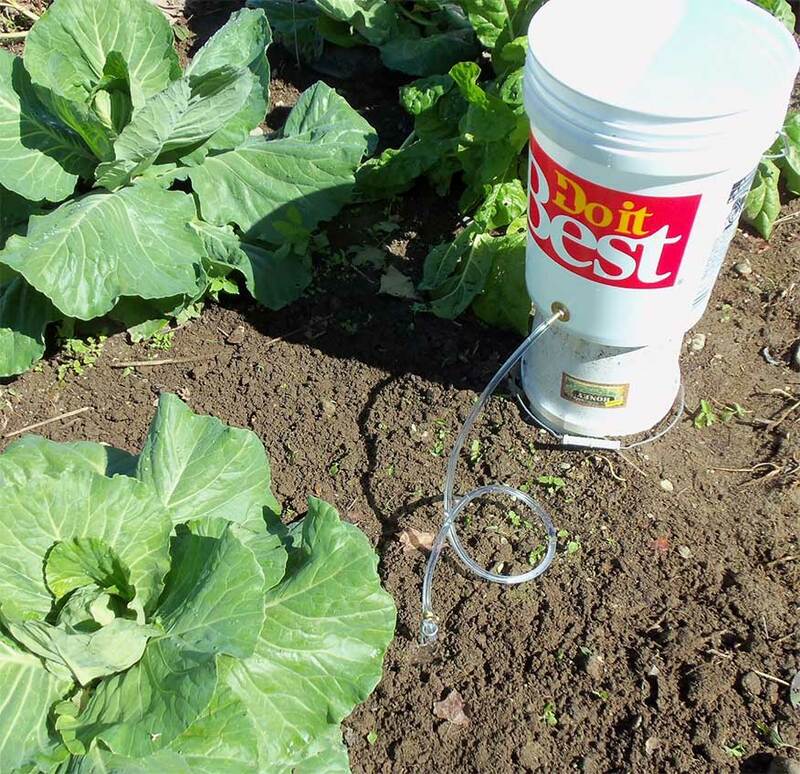 If you’ve got a close-quarters garden bed you want to maintain but don’t want to leave your water on constantly, you can get a system that will only water your plants when they need it. That way they aren’t overwatered if it rains! 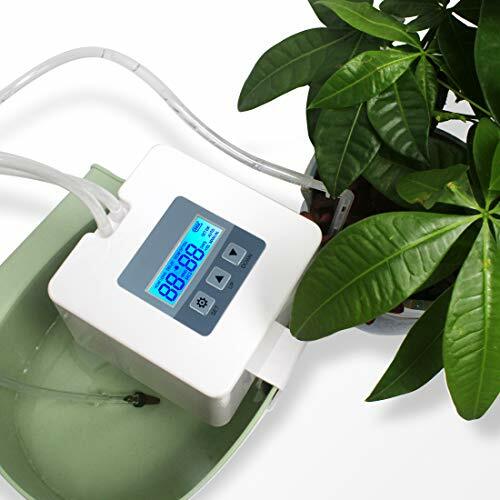 With a reservoir to hold our water, a pump to water the plants, and a moisture sensor to signal the pump to operate, you can have a self-sufficient and totally efficient automatic watering system that only needs to be refilled every so often. Learn more about this project on Instructables. Don’t feel like moving your herbs or plant somewhere new so it’s easier to water? 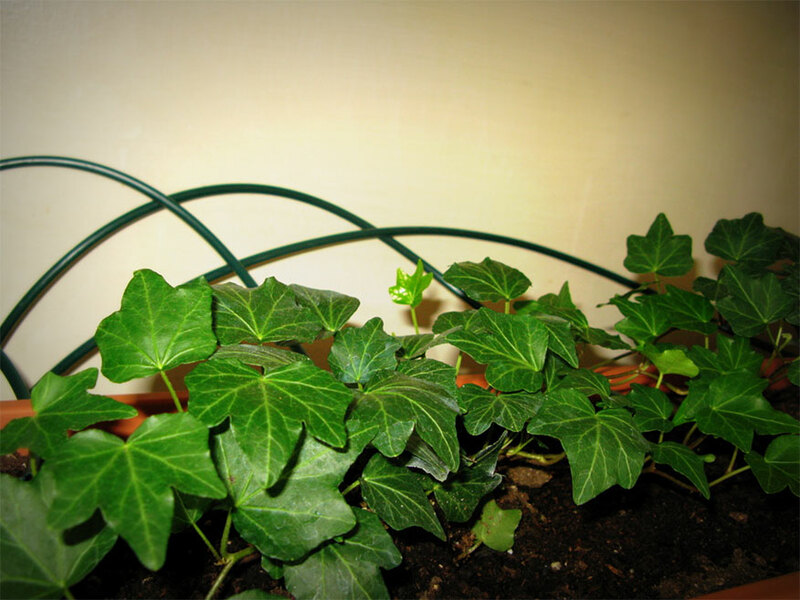 Bring automatic watering to it with a self-watering conversion kit. This kit fits most standard-sized round pots, allowing them to sit above the water reserve that they’ll use to stay hydrated. Depending on the size of the pot, you may not need to water them for weeks once you’re setup (after a week of allowing them to get their rooting down first). Learn more about this kit on Amazon. 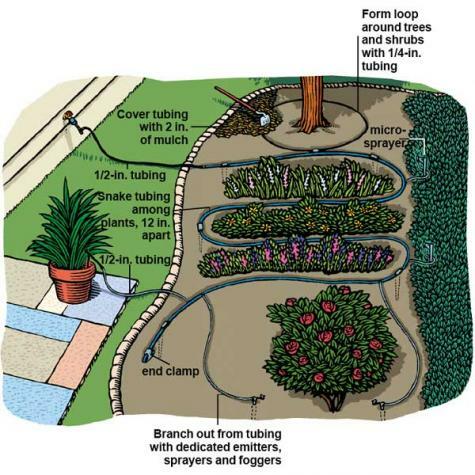 Multiple flowerbeds across the yard often mean multiple watering systems, so having a cheap but effective individualized option ensures each bed gets the proper attention – attention a yard-wide system may not offer. With a simple bucket, tub, or other enclosed container on an elevated platform, you can use the power of gravity to water your dry flowerbeds when they need it. Simply ill the container as high as it goes and let your plants drink until they’re full. Learn more about this method here. 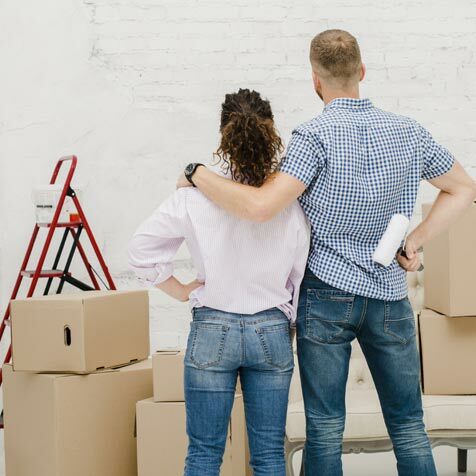 Whether it’s a spider plant in the corner or the basic plant on the windowsill, indoor plants can’t rely on Mother Nature for water while you’re away, so consider these automatic watering ideas to keep them healthy. When soil dries, it gets loose and fine. When soaked, it is more dense – dense enough to stop water flow until water is needed again. With just a bottle or other water-holding device, you can use the power of gravity to keep your plants watered for a few days at a time. Here are a few common household items you can use as a water tank. A cheap, easy, and eco-friendly way to water your plants is to recycle a water bottle. Simply cut a hole in the top for easy refilling and then plunge it into the ground until you can’t see the nozzle. When the dirt needs water, it will flow from the bottle automatically. 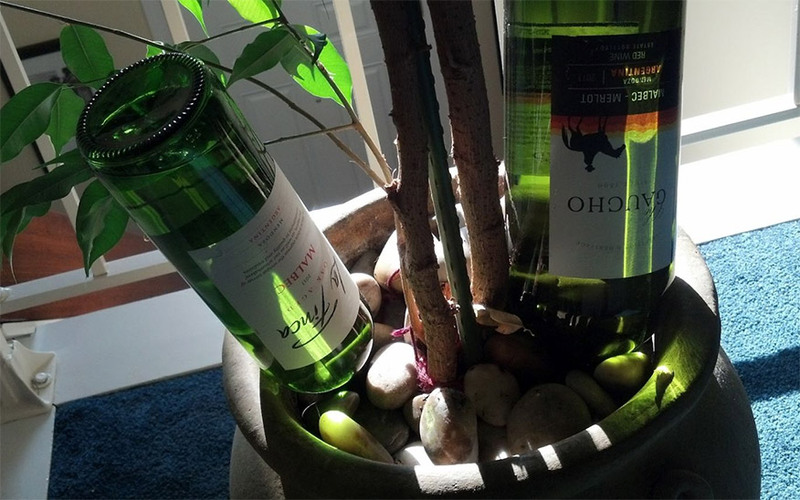 A bit fancier, you can use a wine bottle witha plant nanny the same way you would use a water bottle – simply fill it with water and insert it into the soil. It cannot be refilled from the top, so you’ll have to take it out to refill. However, it will hold more water at a time than the water bottle (depending on size). Don’t feel like DIYing it? Consider Garden Globes – glass water containers with a long neck to slowly release water that is held is the top globe. Simply fill it and place it in the dirt so the water can trickle out as needed. 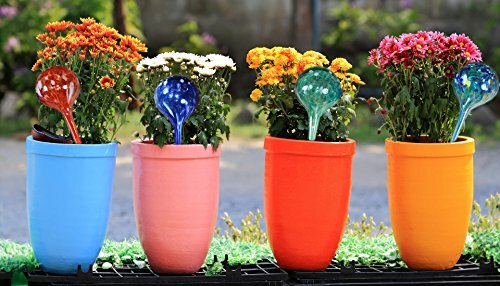 Watering globes are available on Amazon here. Some plants are sensitive to the amount of water they receive, so they need a slower-releasing watering system that doesn’t drown them. With the plastic bag drip system, slow and steady wins the race. 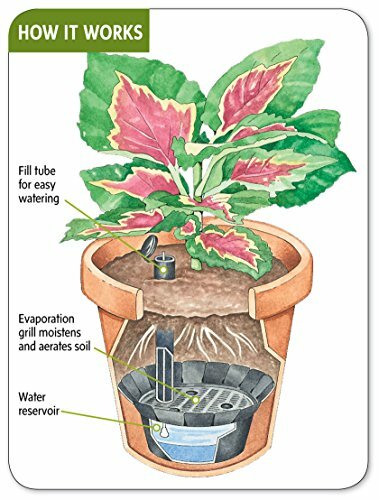 Rather than soaking the soil constantly based on dryness, this low-tech but effective method will drip water like a leaky faucet onto the plants. You can control how much water comes out with the size of the hole, ensuring that your plants don’t drown while you’re gone. You can see the in depth tutorial on this method at Instructables. If you’re looking for a longer-term solution that leverages technology to make automatic watering easier & more convenient, a timed & pump-powered watering system may be for you. It’s so good you may even want to use it when you’re home just for the convenience! 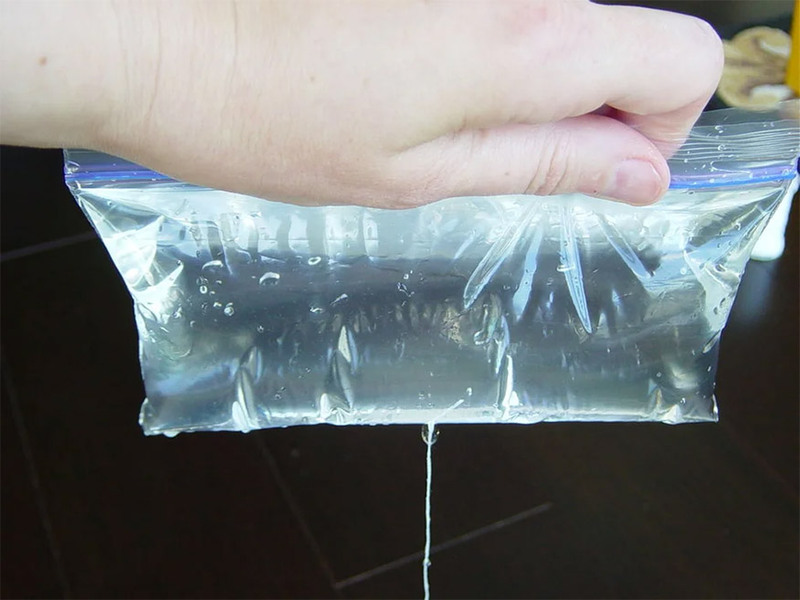 With this method, you’ll be able to use any waterproof container of any size, allowing you to fill it every few days or once a week if your container holds enough water. 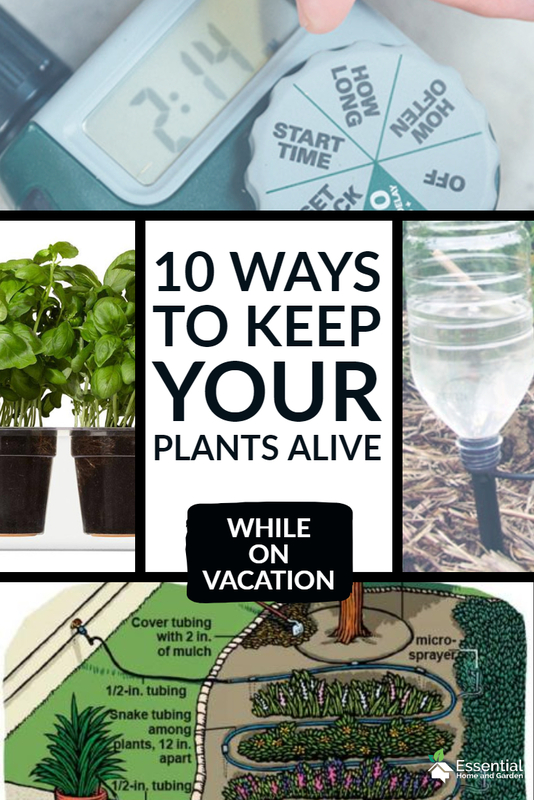 All you’ll need to do is place the pump so it has access to the water source, disperse the tubing to your various indoor plants, and set the timer to water them on a schedule. Whether you’re home or not, they’ll be watered as long as you refill the improvised tank! This method is best when the plants are close together such as on a windowsill because otherwise you’ll have a lot of piping to hide. Not everyone has a mini garden inside their home, so larger options may be overkill. 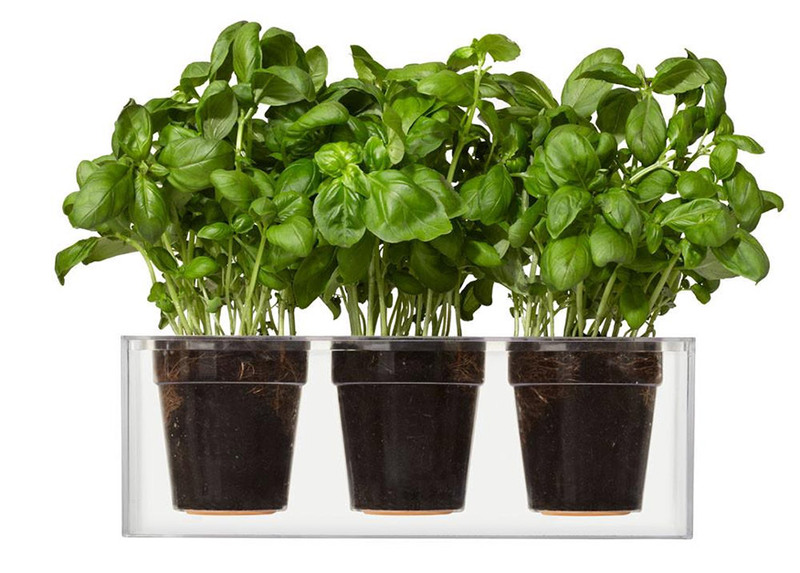 However, with a self-watering cube, you can treat up to a few small plants to a life of modern luxury – and see the process thanks to the transparent materials. A self-water cube uses a reservoir underneath the plant to provide water on-demand. After filling the reservoir, it should last days or even weeks depending on the water needs of the plant. You’ll also be able to see when more water is needed by the water level in the container. Looking for something modern, technologically advanced, and effective? 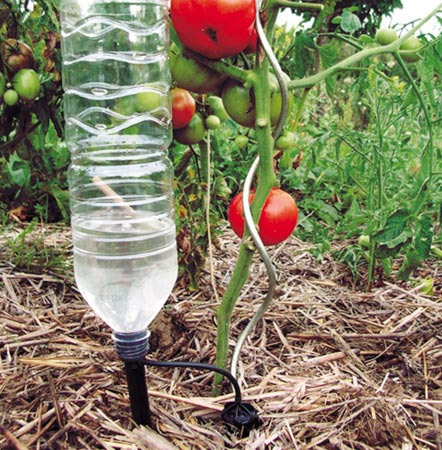 A drip watering machine can help. An automatic drip system allows you to water a collection of nearby plants using tubes attached from the reservoir to watering spikes. The water is gravity-fed, so you’ll need to elevate the machine but once you do, it can deliver variable amounts of water at your chosen intervals. Just fill it once and it should be good to go while you’re on your long weekend or vacation! Whether you’re planning to be away for a few days or simply forget to water sometimes, your plants shouldn’t suffer. No matter your budget, garden size, or handiness level, one of our recommendations above will help you to keep your plants & garden happy & healthy at all times.